Political Pavers | News and Features | Style Weekly - Richmond, VA local news, arts, and events. Not everyone is celebrating the city's sudden interest in the Slave Burial Ground. Scott Elmquist Mayor Dwight Jones celebrates asphalt removal in Shockoe Bottom. The disparate group gathered in parking lot by Interstate 95 Tuesday shared a common sentiment: At long last, asphalt was to be removed from the African Burial Ground. Beyond that, the activists and politicians at the late-morning ceremony were anything but united. Former city councilman Sa'ad El-Amin and NAACP executive director King Salim Khalfani held up signs denouncing Virginia Commonwealth University President Michael Rao, just yards from where he sat. Others who had lobbied hard for the ground’s preservation said they came to observe, not participate. The day, some said, had come in spite of those taking credit, not because of it. “A lot of people here are taking credit where credit is not due,” says Dieyah Rasheed, a member of the Richmond Defenders for Freedom, Justice & Equality. Which people? The politicians and university types who got on board only when they had to, she says. The people who really deserved credit, she says, were the Defenders, the NAACP, El-Amin and many more who worked for years on the project. “If we would not have pushed as hard as we did, nothing would have been done,” Rasheed says. The struggle to preserve the final resting place for slaves and free blacks began several years ago, with lobbying, protests and at least one lawsuit. Finally, the 3.4-acre property was transferred from VCU to the city on Monday. Ana Edwards, a member of the Defenders, said city leaders tried to ignore the burial ground. 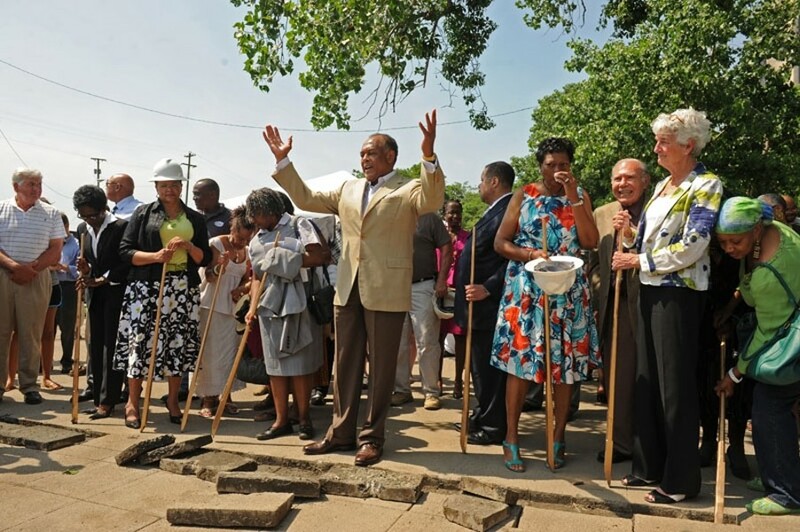 A June 2008 groundbreaking at Lumpkin’s Jail helped open people’s eyes. VCU’s announcement that it was going to use it as a parking lot, despite opposition, further galvanized supports of the ground’s preservation.